When I was a kid on the farm, I used an old power hacksaw to saw steel. My dad used it a lot to build and repair farm related steel items. At some point, he put it in storage in the old chicken house and used a table-top band saw instead. After 10+ years in storage in the shed, I retrieved it to refurbish it. I think Dad bought the saw from neighbor Clark Bentley when he retired and sold out his things at his farm sale. This was in the mid 1960's sometime. I dis-assembled the saw, then put the components (except the 1/4 HP 1750 RPM electric motor) onto the tailgate of my F150 pick-up. I sprayed down the components with WD-40 to remove the grease. I then took the truck to the carwash and power washed the saw components. When I got home, I used a paintbrush and paint thinner to remove the oil/grease the car wash did not remove. I had to order steel from McMaster-Carr and reduced-shank drill bits from another company before I could make the new crank. The electric motor wires were so worn that they were contacting each other. I was able to remove the end plate from the motor and nip the wires back to the point they still were good, or had insulation on them. I made a pigtail and with the end cover loose, the old motor ran!!! However, the shaft was tight on the motor before I dis-assembled it, and the motor would stop as I tightened up and drew down the end cap bolts. As far as I know, electric motor shafts must turn freely when they are assembled. I don't know why this old motor was so tight. I ended up grinding the shaft OD down using my Dremel with a 1/2" sanding drum, then polishing with emery cloth. Once the shaft was free in the assembled condition, I added a switch and new power cord. The gearbox has either a 19:1 or 20:1 speed reduction ratio as per counting the crankshaft arm shaft rotate 1 revolution while turning the pulley. 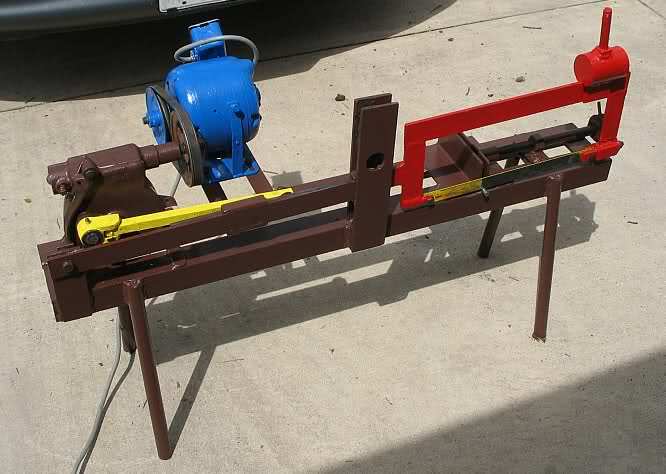 I'm going to paint and assemble the saw using the almost broken crankshaft arm, and see if it will last long enough to saw the pieces I need to fabricate a new crankshaft arm. This old gear box still runs smooth! Next I made the replacement crankshaft arm from steel. I have been doing all woodworking for several years.......with my drill press set to max RPM for drilling and sanding...I never change speeds. I forgot when metalworking and using big bits, you have to slow down the RPM !! I used a 3/16" bit for the dowels to hold it together. The 3/16" bar stock from mcmaster-carr drove/pressed right into the drilled holes fine. I ended up using 3 dowels on big shaft driver to make sure it would not break in service. The old saw was painted all red. I added colors include brown base, blue motor, yellow power arm, and red sawing arm. Looks pretty snazzy !! It took longer than I thought to draw this saw in Google Sketchup. But, there is a lot of pieces if you count every nut and bolt. The refurbished saw works now just as good as it did in the 1960's when I used to run it as a kid!! It is ready for another 50 years of service.